Since its beginning, Galería de la Raza (Galería) has been a keystone institution for San Francisco Bay Area, but especially the Mission District neighborhood in San Francisco. Our physical space situation has been on a month-to-month basis for 46 years despite attempts to change the arrangement with the landlord to a more stable agreement for Galería and the community. Given the real estate economic reality and signals of what may come our way, since 2015, Galería has led a historic advocacy campaign to secure a permanent home within its longstanding Mission District neighborhood. Galería's plan was to transition from its current 46-year, month-to-month rental status to a permanent site in the year 2020, all while continuing its operations at its current location on 24th & Bryant Street. Unfortunately, in June 2018 we received notice of a 100% rent increase effective August 2018 for the space we are currently occupying. Through the summer we were able to negotiate with the property manager to maintain our tenancy at our current rental rates but moving forward have to forgo the 2857 main gallery space. Even though this is a dramatic reduction in our physical space, without a matching reduction in our monthly rent, we believe maintaining a presence within the community at our corner storefront, Studio 24/ Digital Mural Project, is something we must do for the community and the community arts and culture eco- system we have flourished in. That said, as of November 5, 2018, Galería will permanently vacate its main gallery space, making Studio 24 our primary operating hub. Because it is critical for the cultural and arts work to persist and enrich community, Galería will engage in a series of "on-the-go" programs. Our work will continue to center and celebrate San Francisco's Mission District and the many pivotal social justice efforts that continue to this day. These efforts include the Latinx social, cultural, and political movements that informed, inspired, and shaped the vibrant cultural life of San Francisco. While our amazing work continues, over the next 18 to 24 months, Galería's board, staff, and long-time supporters will initiate a capital campaign. Through a growing partnership with the Mission Economic Development Agency (MEDA) and the Tenderloin Neighborhood Development Corporation (TNDC), Galería is working to secure a long-term multiyear lease, with an option to buy, at a new facility in the Mission district - 1990 Folsom Street (cross street 16th). By removing the insecurity of a month-to-month lease arrangement and increasing rent for less space, Galería's legacy as a local and international platform for expression of the highly diverse and evolving Latinx cultures will continue from a more stable and permanent platform. The result will be to continue and further enrich the overall cultural life, history, and entrepreneurship of San Francisco and the Bay Area. Galería's move to a permanent site in the Mission is part of a strategic vision informed by creative "place keeping" practices in which community arts are central to navigating the complex intersections of urban redevelopment, social inequality, affordable housing, and the historical cultural legacies of communities of color. For the Board and Staff, coming to this decision was not easy. Our priority has been to be responsive to our communities' needs and desires, which include that long-standing cultural institutions, such as Galería, remain in the Mission District and continue to offer and expand its local and world-renowned community-based programming. We understand the timing of this culturally-grounded capital effort is pivotal, especially given the dwindling commercial spaces and the onslaught of San Francisco commercial developments in the Mission District. Considering the overall real estate dynamic, we feel this permanent relocation opportunity and current civic commitments may not be available again. We Are Rooted and We Belong: How to Resist Cultural Displacement in Changing Communities, webinar hosted by Policy Link. Galería is excited to participate in conversation with our partner MEDA and our colleagues from the Kelly Strayhorn Theater. Event: Día de los Muertos and closing reception of the Comida Es Medicina exhibition. This is our farewell celebration of the main gallery space, which has hosted our main exhibitions and public programs since the late 80's. Details on day of program will be made available on our website and social media channels. Because nouns in the Spanish language are gendered male or female, several years ago many activists and scholars began to use Latin@, with the @ representing "a" and/or "o" to signal both women and men; reflecting new consciousness, many activists and scholars now increasingly use "x" to replace the "a" and "o' in order to break completely with the gender binary. See, e.g., Cynthia E. Smith, "Designing an America of the People, By the People, and For the People," https://www.arts.gov/art-works/2016/designing-america-people-people-and-people; and Policy Link, "Creating Change through Arts, Culture, and Equitable Development,: http://www.policylink.org/creating-change-through-arts-culture. About the Image:The image, Este Barrio Se Defiende, was created by artist Jessica Sabogal. Galería thanks Jessica for their ongoing support and permission to utilize their work for this announcement. Sabogal's statement: "This mural was created to honor the legacy of the quickly gentrifying Rose Park district in Salt Lake City, Utah. Our neighborhoods are slowly disappearing - artists, cultural workers, and families that have inhabited our sacred spaces for decades have been forced out due to colonial forces with no sense of historical context or moral responsibility. We all know this story. Galería gave me a home some five years ago. She raised me, gave me nutrients, taught me about my ancestors and how to pave the roads for future generations as others have done for me. 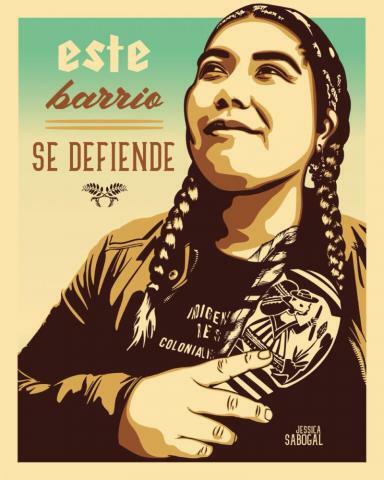 I changed the words of the original mural from "Este Barrio No Se Vende" to "Este Barrio Se Defiende" to honor the resilience and downright relentlessness of the Galería. Nearly 48 years since its creation, Galería has never deviated from its original mission, which was to create a space for ourselves that which did not yet exist. Yes, we are loosing our main Gallery, but what's to come is bigger than we could've ever imaged." About the Image: The image, Este Barrio Se Defiende, was created by artist Jessica Sabogal. Galería thanks Jessica for their ongoing support and permission to utilize their work for this announcement.